The Groumall was jury-rigged with large planetary disruptors salvaged from the destroyed outpost on Korma. The upgrade required emptying the cargo bay, which cost Dukat his profits. Plays on your freighter, transport or merchant vessel. Ship is WEAPONS +4, but is SHIELDS -1 and no longer qualifies as a freighter, transport or merchant vessel. Requires: Freighter Class, Merchant vessel, Transport. 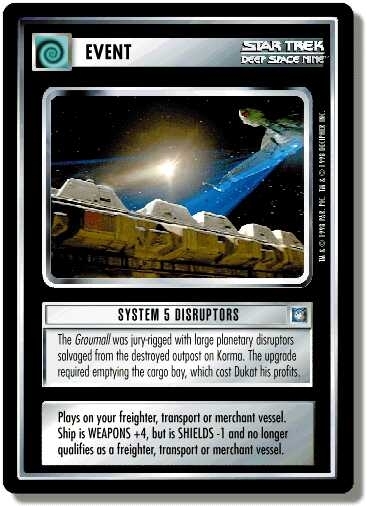 There are 33 entries for System 5 Disruptors (ST1E 5 R 72) at the Tradeplace (28 haves and 24 wants). Click here to see all trade list entries for this Rare card!